Conor Walton is a painter with expansive ideas who is both intellectually and technically equipped to make grand scale paintings tackling social, political and philosophical themes. 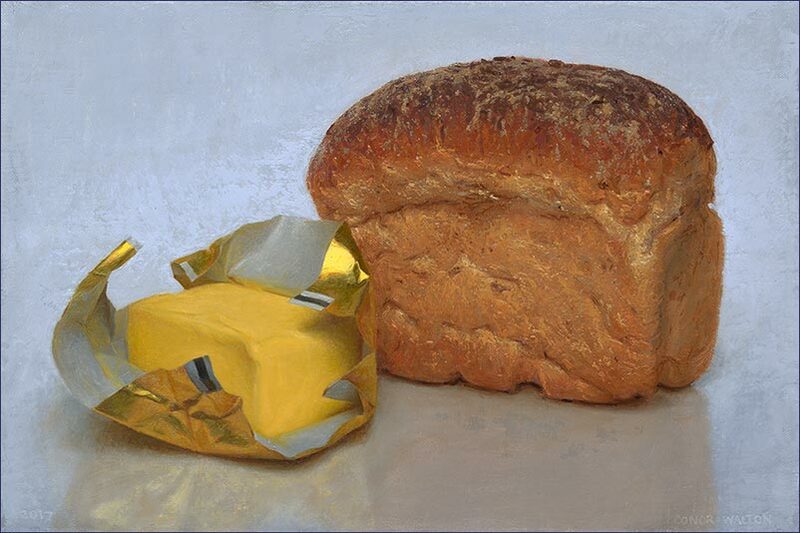 Yet some of his most riveting works are deceptively simple, modest compositions featuring bread and butter. These domestic still-lifes have a hauntingly mesmerizing quality about them. They recall the window sill still-lifes of Francisco de Zurbarán and convey an almost Franciscan humility that imbues their subjects with a devotional character. They are not flashy, they do not call attention to themselves or come off as overtly didactic. Yet the paintings invite a meditative consideration in which they reveal their mysterious implications through a masterful attention to detail and seductive virtuosity in their handling of paint. Bread is the staff of life and the artist’s treatment of this subject somewhat unavoidably carries a Eucharistic semiotic. Yet these paintings aren't necessarily overtly religious in a literal or dogmatic sense. Their experience is as much a Zen sensation as a Christian one. The details of the surfaces of the artisanal bread have an almost geologic feel as each crackle and flake is meticulously rendered in obsessive observation of the chaos by which those events occur at a molecular level. The surface is a record of a natural process as the yeast bearing bread is literally alive and responds to the kinetics of the baking and cooling to yield this organic event. The artist’s process is one of discovery, of phenomenology, of contemplation. These are undeniably studies yet they are not somehow less complete, less sufficient or any less satisfying than the artist’s more grandiose compositions. 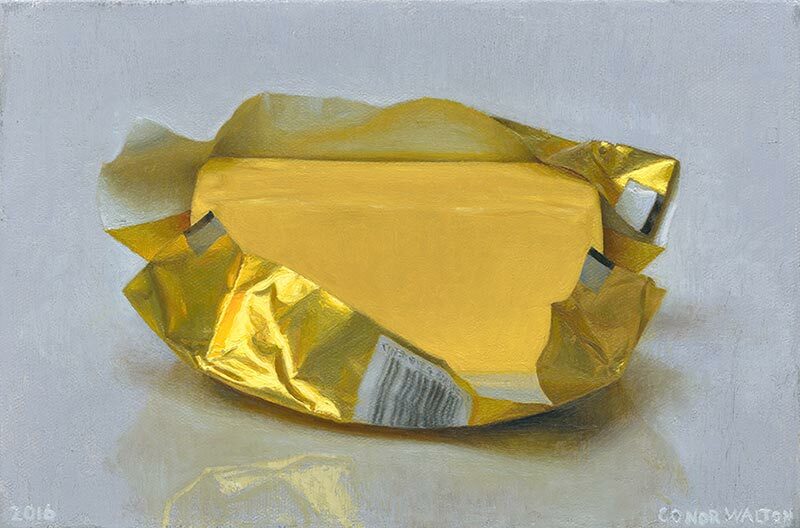 Whether a loaf of bread, a half-wrapped stick of butter or a bunch of grapes, the depiction holds the viewer's attention and, though forthright in its subject matter, it implies a greater semiotic that is nuanced and ceremonial. 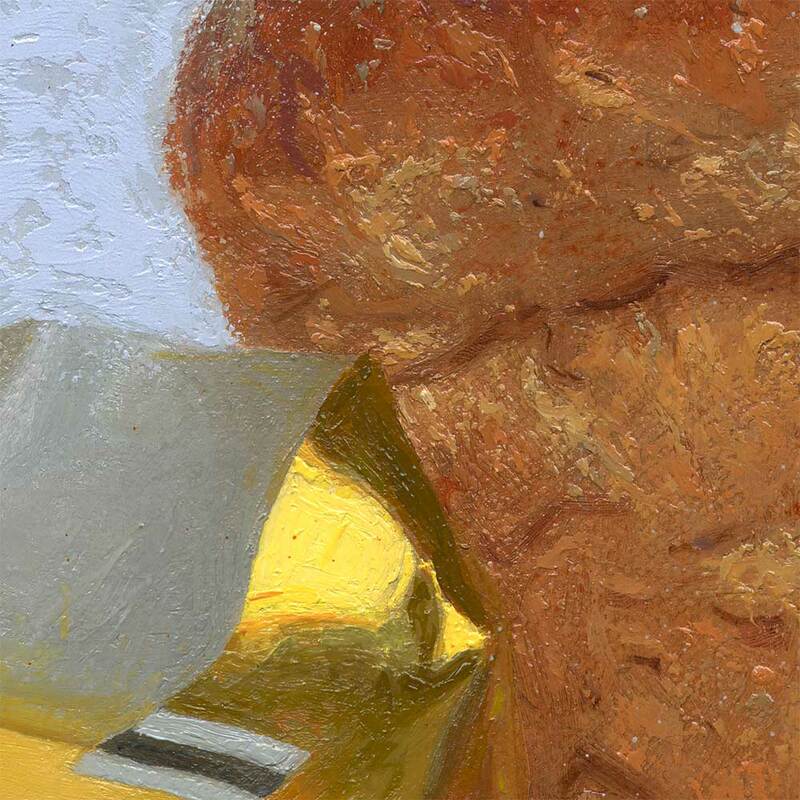 The artist has some ambivalence about painting still-lifes and the process did not come easy to him. He wanted to paint people, big themes and subjects … to be a history painter. Indeed, he has made some important achievements in that arena. Yet first, he needed to train as an observational painter. Making 'bread and butter' paintings is analogous to playing scales and, as any great musician will testify, mastering those scales is a lifelong pursuit. Historically, still-life has been dominated by two approaches: either the tasteful, beautiful simplicity of the subject, transcendent of materialism, or as a vanitas imbued with a morbid guilt about materialism. Both emerged in the early Modern period in response to the ascendant materialist culture of the West. Walton readily admits to some degree of vacillation between the two approaches, and often enjoys constructing complex allegories and giving his "lurid instincts" free reign when pursuing the vanitas mode. For the artist, however, the allegorical nature of traditional vanitas paintings is paradoxically a type of vanity. Walton says that he feels somewhat disconcerted at how tasteful the 'bread and butter' paintings look. There is an almost monkish sensualism about these paintings, at once critical and perversely celebratory of their materiality. In one sense, they represent virtually pure analysis, but in another, they are charged with an enigmatic nuance and the inference of morality. Walton has an affinity for deep content and managed to find a way of importing an implied narrative into the work without being too literal or overtly allegorical. By contrast, he constructs a notion of pure still-life. Yet these unobtrusive paintings seem to have an alchemical feel to them as if they were efforts to turn a humble original substance into aesthetic gold. For the artist, the paintings have become a discipline, not just in technical mastery, but in meditation and observation. For Walton, they are as much about their process as the beauty of their outcomes. While the artist never intended to spend so much time making such precious little paintings, he has come to terms with the essence of still-life and says he just wants to get better at them. But I suspect that, like the paintings themselves, there is more embedded in that aspiration than first meets the eye. It is not only technical mastery at stake but a deeper self actualization that comes from the process of careful contemplation itself. Joseph Bravo is from San Antonio, Texas. As an art historian, museum director, curator and writer he has devoted his life and career to education and the interdisciplinary study of art and curation.